Knowing God is vital to living a Christian life. But how does someone come to know the true God? What does the Bible reveal as the way to come to know Him? When you get right down to it, there is nothing more important than our relationship with God—getting to know Him on a deep, personal level. To make us His own sons and daughters is the purpose and plan of God in a nutshell. Offering humankind the opportunity to become God’s own children is the central theme of the Bible. God wants to build a relationship with us. God truly wants us to come to know Him. But what must we do to come to know Him? To understand what is needed to have access to God’s Holy Spirit, please read the booklet Change Your Life! But if God is calling you now, how do you get to know Him? How does anyone get to know anyone else? How is any close personal relationship developed? Close relationships require time to be spent together. However, a close relationship requires more than just time. For example, there may be people we work side by side with on a daily basis but don’t really know. We don’t have a deep relationship with them. Coming to truly know others requires that we learn how they think, what values they hold dear, what motivates their actions and what convictions they embrace. The same is true if we are seeking to know the true God. Coming to truly know others requires that we learn how they think, what values they hold dear, what motivates their actions and what convictions they embrace. The same is true if we are seeking to know the true God. The question is: How do we do this with God? How do we spend time with God? How do we learn His values, convictions and motivations―in other words, how He thinks? God has revealed all of these qualities in the words He inspired to be written in the pages of the Bible. And, more specifically, in the words of the commandments He gave to mankind―the 10 Commandments. Where did the 10 Commandments originate? They came from God’s mind. They are not just arbitrary ideas that He devised or thought up. The commandments came from and reflect His very nature. And the quality that most clearly and thoroughly describes God’s nature is His love. “God is love” (1 John 4:8, 16). Therefore, if we are going to come to know God―learn His values―understand how He thinks, we need to study and meditate on (think deeply about) His commandments, which reveal His mind. 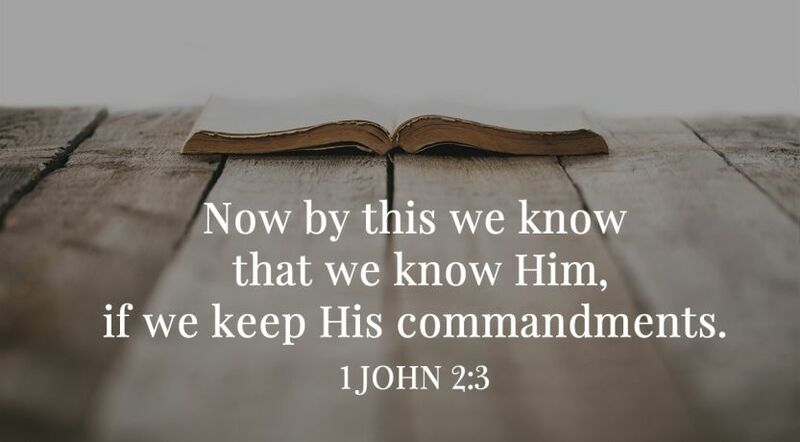 This is exactly what the apostle John said to do in some fairly strong terms: “Now by this we know that we know Him, if we keep His commandments. He who says, ‘I know Him,’ and does not keep His commandments, is a liar, and the truth is not in him” (1 John 2:3-4). John clearly said that we can come to know God by keeping His commandments. How does obeying God’s commandments enable us to come to know God? To understand this, we need to grasp that there are two vitally important aspects of God’s laws. There is the letter of the law. This is what the commandment says to do. For example, “You shall not murder” (Deuteronomy 5:17). As long as a person does not commit murder, he or she is keeping the letter of that commandment. Therefore, the letter of the law describes what we should do or not do. Then there is the spirit of the law. The spirit of the law reflects and reveals some aspect of God’s mind of love. The spirit of the law reveals how God thinks about that subject. Keeping the spirit of the law takes place in the mind. Jesus came and revealed the spirit of the law. In the Sermon on the Mount Jesus said, “You have heard that it was said to those of old, ‘You shall not murder, and whoever murders will be in danger of the judgment.’ But I say to you that whoever is angry with his brother without cause shall be in danger of the judgment” (Matthew 5:21-22). Please understand: The spirit of the law describes how God thinks about the subject of the command. Murder is often preceded by anger, bitterness and hatred. To keep that commandment in the spirit, we must not let these negative attitudes take root in our minds. We must keep the spirit of God’s law, which is love. Therefore, the spirit of God’s laws reveals how God wants us to be, not just what we do. If we are seeking to come to know God, the spirit of the law reveals how He thinks. The spirit of each of God’s 10 Commandments reveals some aspect of God’s mind of love. God’s love is the fundamental quality of God’s nature behind all of His commandments and laws. Please read Matthew 22:35-40. The first four of God’s 10 Commandments reveal how we show love toward God. The last six reveal how we show love toward our neighbor―our fellow man. God said, “You shall not steal.” Why? What is the spirit of that law? What does the spirit of that law reveal about God’s mind? God indeed doesn’t want us to steal from our neighbor. But He wants more. He wants us to love our neighbor. Not only do we not take from our neighbor; but we are proactive so that we also strive to protect what our neighbor has out of love for him or her. We need to meditate on the spirit of God’s laws. We need to be asking God in prayer to reveal to us His mind of love reflected in the spirit of His laws. As we come to understand God’s mind of love behind His laws, we will come to know Him better, especially if we are seeking to live by what we learn. This is how we come to know God. What Did the Apostles Believe About God? Jealous God? What Does That Mean? Fear of the Lord: What Does It Mean? What Is God’s Will for You? Is There a Time to Judge God? Whose Opinions Really Matter: God’s or Man’s? Genesis 6: Does God Make Mistakes? Learn More About Who Is God?